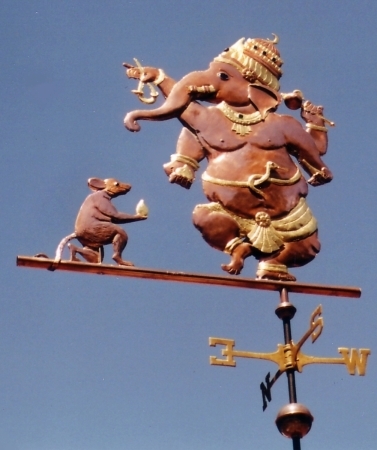 Our Ganesha Weathervane was made for a customer in Southern California who was particularly devoted to this beloved Hindu god. Ganesha गणपति (also spelled Ganesa or Ganesh) is one of the best-known and most popularly worshipped deities in Hinduism. Although he is known by many other attributes, Ganesha’s elephant head makes him easy to identify. He is worshipped as the lord of beginnings and as the lord of obstacles (Vighnesha), the patron of arts and sciences, and the god of intellect and wisdom. Ganesha is also a popular figure in Indian Art. Representations vary with distinct patterns changing over time. He may be portrayed standing, dancing, taking heroic action against demons, playing with his family as a boy, sitting down, or engaging in a remarkable range of contemporary situations. He has the head of an elephant and a big belly. He is often depicted with four arms and he frequently holds a goad, which helps him propel mankind forward on the eternal path and remove obstacles from the way. The noose in Ganesha’s hand is a gentle implement to capture all difficulties. In another hand, he holds a sweet delicacy known as a laadoo. Another important symbol is his own broken tusk, which he holds as a symbol of sacrifice. He broke the tusk off to use in writing down the famous Indian classic, the Mahabharata. The motif of Ganesha turning his trunk sharply to taste the sweet which he holds in his hand is a particularly archaic feature. 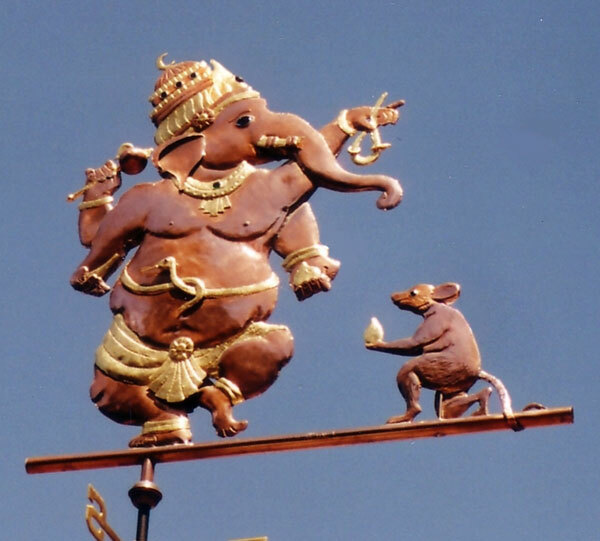 Ganesha is frequently shown riding on, or attended by, a mouse or a rat named Mooshika. In our depiction Mooshika is offering Ganesha another laadoo. 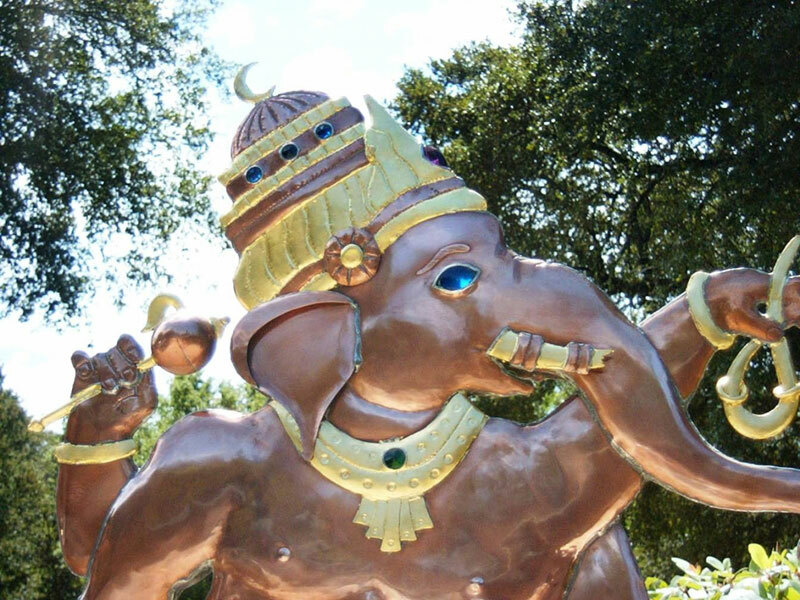 According to tradition, after eating a large number of his favorite sweets, Ganesha’s poor belly burst open and he used a snake to close it up again. 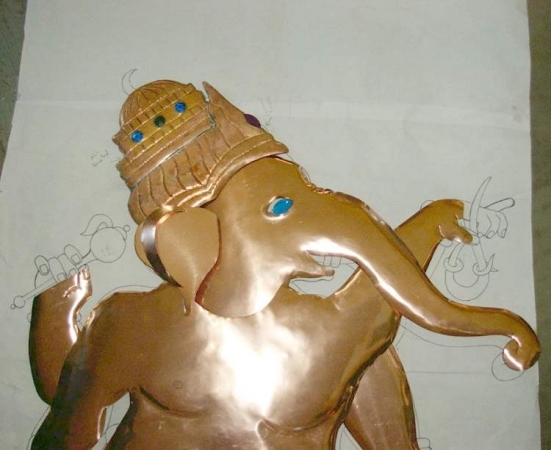 In this construction we included a number of brightly colored glass ‘jewels’ in Ganesha’s crown in addition to the glass eyes of both Ganesh and Mooshika. 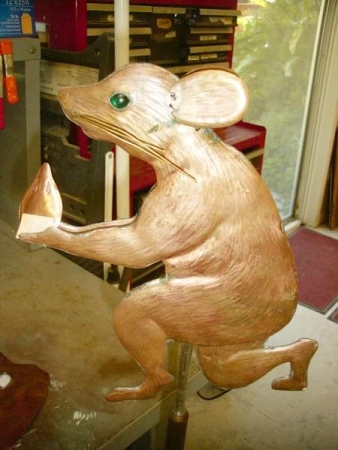 Our customer requested extensive optional gold leafing to maintain a bright contrast with the copper over time as the weathering process first darkens, then greens in its patina process. 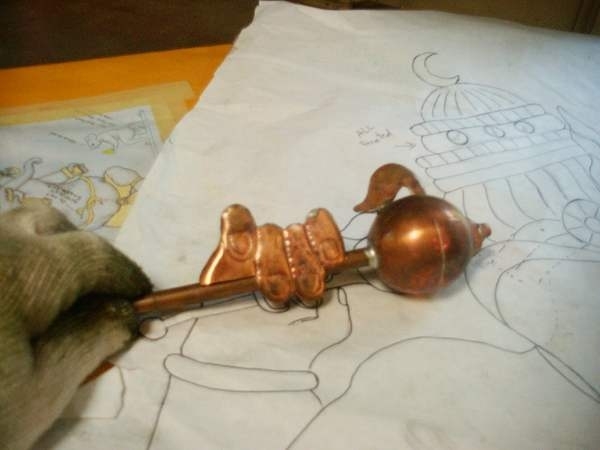 In addition to the image of the finished weathervane, we’ve included some pictures taken while it was being made so you can see some of the details that went into it’s creation.